The Braun series 9 shaver is one of the greatest series from the world-renowned brand, Braun. On top of that, the 9090cc model is loaded with features. This shaver has already made a name for itself in the shaving industry. We have performed trials of this product from Braun. The result is an unbiased review that can give our readers a complete idea of the performance, price, and quality of this product. The very first thing that will make you uncomfortable before buying this Braun Series 9 9090cc is the price tag. You have to spend almost $400 if you want to be the owner of this high-quality shaver. Nonetheless, as always, you can get the product for less from online stores like Amazon. However, the price of this shaver truly reflects its quality. Braun certainly can’t give your money back, but it will give you such a service that you will be satisfied even after spending that big amount of money. The Braun Series 7 came out on the market six years ago. It was quickly crowned as the shaver of that time. Not only was it wildly popular at that time, but also during these present times. If you search for this shaver on the internet, you will find that this Braun Series 7 799cc is still at the top of the lists of some shaver review sites. This specific razor is very popular and it’s understandable due to all its features and perks. The Braun Series 9 has come out with 5 high-quality shavers. Braun 9090cc, Braun 9095cc, Braun 9050cc, Braun 9040cc and Braun 9030s are the shavers which are included in this series. Today, we are going to give a review on the Braun 9090cc shaver. This is a pure dry shaver which has a cleaning dock and charging stand. This shaver has all the new and exciting features that other excellent shavers are offering including its new and modern features. I will inform you about these features here in my Braun 9090cc review. From the very first time you unpack the shaver and feel it in your hand, you will notice the presence of an asset. Braun is a German shaver manufacturing company. That is why almost all the body parts of this shaver are made of plastic. The grip of this shaver is made of rubber so there is hardly any chance of the shaver slipping out of your hand while shaving, even if your hands get wet. I expected something extraordinary from Braun, regarding the battery life and as usual, they met my expectation. The battery gets a full charge in one hour. Moreover, a full charge of the shaver can consecutively run for 50 minutes, which is enough to get the close shave you want. The best Braun electric shavers make great use of the Lithium-ion battery. If you are in a hurry and the battery suddenly drains out, then you don’t need to be tense. The experts behind the Braun brand came up with a quick charging technology. You can charge the battery for 5 minutes and easily finish your shaving without any complications. The charging and cleaning station is a great tool to keep the shaver safe from any harm. This platform always keeps it ready for the next use. When the light is red on the display, it means that the shaver is charging. The cleaning station is also working as a charging dock. It will take five minutes to completely clean the shaver, including the drying process. This cleaning system keeps the shaver germ-free and hygienic. Inside this station, you will find a cleaning cartridge. Regarding this piece, you will need to change it after a certain period of time. The impressive part about this technology is that you will not find a single hair on your shaver after this cleaning station finishes its routine. 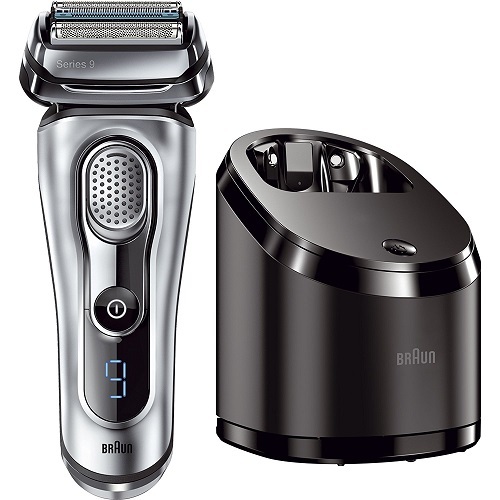 However, the most complex function of this Braun series 9 shaver stands in its SyncroSonic tech. This feature amplifies the efficiency of its 4 blades. On top of that, each of these elements is in charge of one particular task. They were specially designed to carry out their core duties flawlessly. More exactly, this technology offers Intelligent Sonic Technology, Direct and Cut Trimmer, HyperLift, and 2xOptiFoil. On top of these, the shaver is 100% waterproof while its trimmer function serves users with cutting-edge precision. This shaver is just perfect in all aspects. 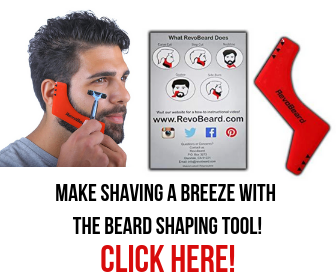 Whether you are trying to shave the sideburn or the neck hairs, this will work just fine everywhere. You just need to switch on the power button and move it where you want to shave. The rest will be done perfectly by this awesome shaver from Braun. One last function that is worth mentioning is the Hyper-lifting technology. This is one of the main reasons why this shaver can cut the hair that easily. It automatically uplifts the flat-lying hairs and cuts them from the root. As a result, you will get the closest shave even in the toughest areas. On top of that, you won’t have to suffer anymore from any type of irritation like burning, nicks, cuts or hair plucking with this top electric shaver of 2018. This shaver is designed to take care of sensitive skin. Consequently, you can buy this shaver without any hesitation. Finally, The Braun Series 9 shaver 9090cc is the best electronic shaver out there in the market. You can’t simply ignore this shaver for you will undoubtedly get excellent performance. You can do finally create for yourself any style you like and you will get your satisfaction after using this shaver.